Pro Tour Oath of the Gatewatch features a new and exciting Modern format. With Splinter Twin and Summer Bloom out of the picture, players were forced to explore new strategies as they prepared for the big show. With Day One in the books, we can start to analyze which decks lived up to the pre-show hype. Two hardened Modern staples, Affinity and Burn, were far and away the most popular archetypes. These aggressive decks were proactive enough for an unknown metagame while offering up the speed necessary to compete with new combo strategies. These two strategies still top the field in terms of presence, but their conversion rate to the second day of competition leaves something to be desired. The biggest story to come out of Modern is the success of the Eldrazi deck. This deck aims to power out cards like Thought-Knot Seer and Reality Smasher unreasonably fast with the help of Eye of Ugin and Eldrazi Temple. At large, Eldrazi decks had a staggering 81.3% chance of making it to Day Two here at Pro Tour Oath of the Gatewatch. 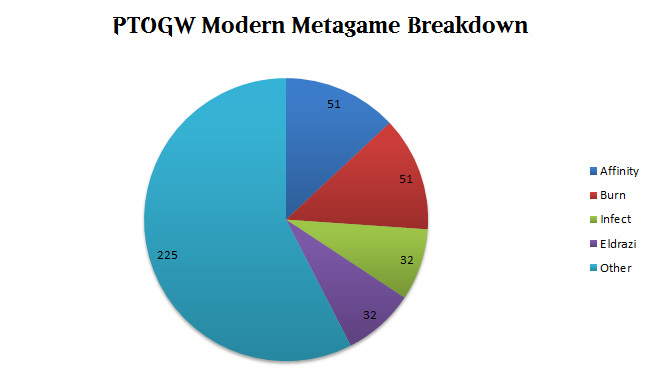 When we start to look deeper, we'll notice different versions like the colorless deck played by Face to Face and ChannelFireball and the Blue-Red version played by East West Bowl. Eldrazi strategies, when combined, approach an insane 90% Day Two conversion rate. Infect is another success story. Infect is a combo strategy that uses Modern's best pump spells at double their normal efficiency by poisoning the opponent. The deck may not have done as well as our Eldrazi overlords, but it did put up a 78.1% Day Two retention rate that is sure to raise some eyebrows. It's still early, but Infect is quickly proving that it has what it takes to be the new tier-one combo strategy of the format. Infect players that made it to Day Two are expectedly terrified of the Eldrazi decks that punish them with Chalice of the Void, Ghost Quarter, and post-sideboard Gut Shot. Midrange decks like Abzan and Jund that back up disruption with the format's best removal and efficient threats have found themselves in an awkward place, as the Eldrazi rise to the top of the standings. Cards like Abrupt Decay match up very poorly against things like turn two Thought-Knot Seer, and Reality Smasher represents a huge problem even when it's dealt with. The biggest miss this weekend was Zoo. A lot of players brought the deck, which features strong creatures in an aggressive shell, figuring that its proactivity and speed would be resilient in an unknown field. Unfortunately, the Eldrazi deck makes bigger monsters on the same early turns, allowing it to play better offense and defense in the match-up. Death's Shadow Aggro, a deck that uses its life total as a resource before attacking with a massive Death's Shadow to win around the third turn, has put up great results in the hands of Team EUreka. The latest version of the deck features Temur Battle Rage and Become Immense, a combination that's proven quite strong for Standard that has now made its debut on the Modern stage. Land based strategies like Scapeshift—a deck that uses Valakut, the Molten Pinnacle and Scapeshift to one shot opponents—and Tron—a deck that combines Urza's Tower, Mine, and Power Plant to make degenerate plays like turn three Karn Liberated—over-performed on Day One. These decks are actually capable of containing the new Eldrazi deck, and could pose a problem for the format's newest bad boy as we approach the later rounds in Day Two. These decks seem well-positioned for victory if they're able to penetrate the Top 8 of this weekend's event. It looks like Eldrazi, Scapeshift, and Tron are all well-positioned to do big things this weekend, but there are a handful of players armed with Blue Moon, a deck that combines good countermagic and interaction with Blood Moon to punish the now dominant decks that rely heavily on their lands. 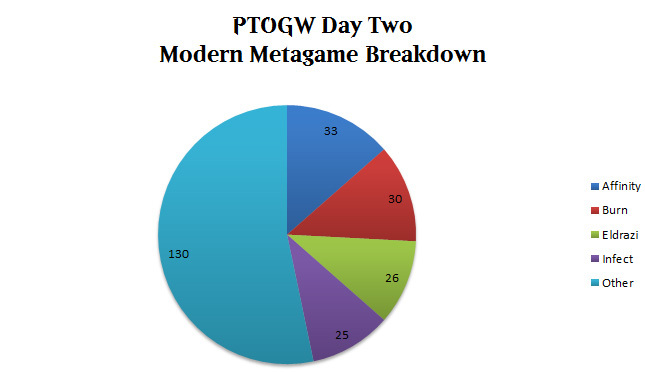 Here's a full breakdown of what the Day Two Modern metagame looks like here at Pro Tour Oath of the Gatewatch! After today, only eight players will return for the elimination rounds tomorrow. Will Eldrazi and Infect continue to dominate the weekend? Or will the riff raff rise up as we approach Sunday? Stay tuned to continuing coverage of Pro Tour Oath of the Gatewatch for all the action as it unfolds.